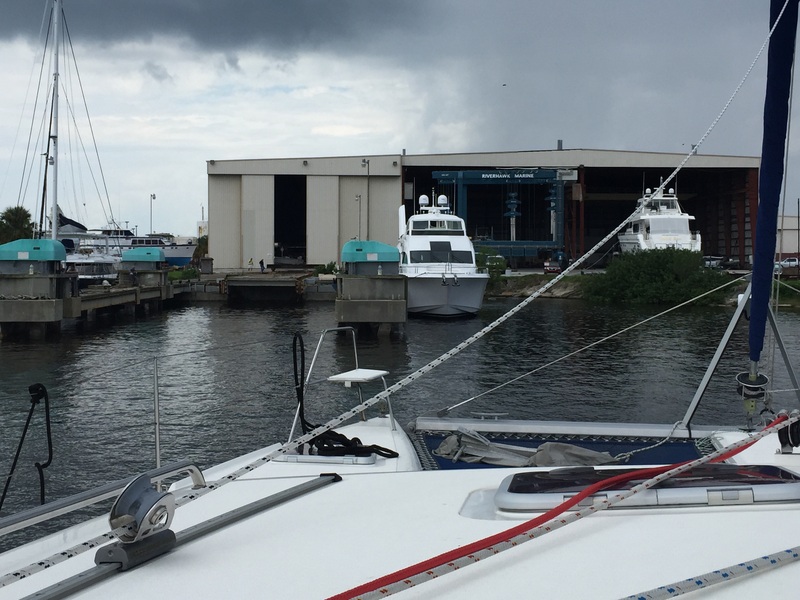 We hauled our boat out of the water yesterday at RiverHawk Marine in Tampa, Florida. With our boat ‘on the hard’ we plan to do some repairs that we couldn’t do if our boat was in the water. For example, we will be doing some repairs on the keels, and a graphic artist will be placing our logo and lettering on the sides of our boat. To perform the haul-out, RiverHawk Marine uses a SyncroLift system. The system involves 4 cables, capable of lifting 123 tonnes each. Our boat weighs 12.5 tonnes, well below the capabilities of the system at RiverHawk Marine. …[The] Company can accommodate vessels up to 200 feet and 14 foot draft for in-water repairs and up to 160 feet for projects that require hauling for more extensive work. Our haul-out was a 2-hour process, and involved precision and constant communication between RiverHawk Marine owner, Frank Hohenhouse, and his team, which included many workers, and a diver. With SV Aphrodite successfully lifted out of the water, RiverHawk diver emerges as marine expert and our advisor, Pat Reischmann, looks on. During the haul-out process we were glad to have the experience and advice of Pat Reischmann and Dave Houston. Dave’s experience as a former owner of a St Francis 50 catamaran proved to be invaluable. Dave identified to the boatyard owner, Frank, that the keels are mostly structural and strong, but that the back parts have a 2-foot tapered ‘wing’, which is there for sailing efficiency. That skinny part of the keel can shatter if the SyncroLift were to put pressure on it. Unfortunately Dave learned this first-hand. When he did a haul-out, the keel on his St Francis 50 catamaran shattered at his boatyard and had to be repaired at the boatyard’s expense. To give you a sense of scale, below is a picture of the aft part of one of our keels. Skinny, tapered part of our port keel. 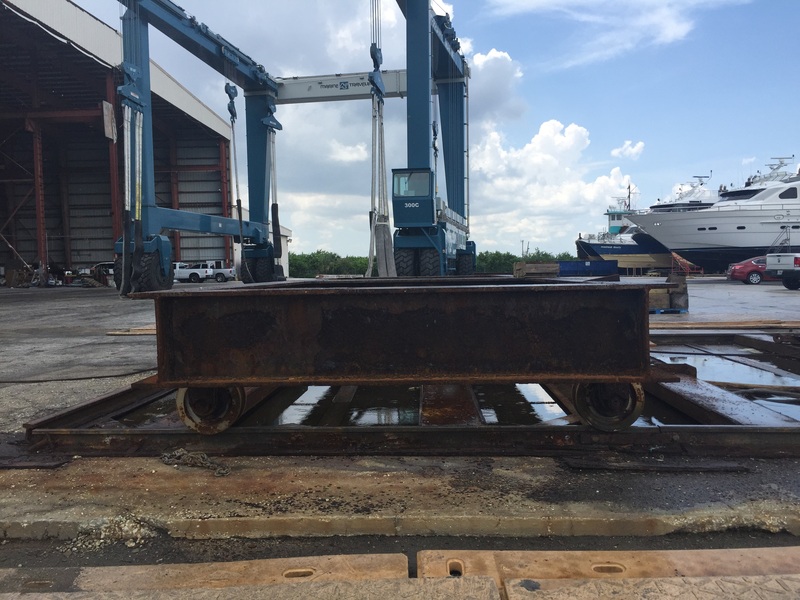 With the skinny, fast, but possibly unforgiving keels in mind, the RiverHawk team began the SyncroLift process by lowering a large piece of railway cable car into the water. The cable car that was placed under our boat. While they were submerging the cable car, we got into the boat and motored into a docking area. Below is a picture of the boatyard docks. We docked the boat in the area between the turquoise boxes, which are part of the SyncroLift system. With the cable car beneath our boat, the RiverHawk team positioned the boat exactly right. The diver had a lot of responsibility. His role was to ensure that the lifts were not placed too far back on the keel. The diver communicated to Frank by raising his fingers, indicating the number of inches to move our boat. Frank communicated by walkie-talkie to his men. The workers tied and re-tied our boat on the dock cleats to get our boat perfectly in place. Finally, the boat was lifted until the cable car was elevated and aligned to move along a railway track on the dock. Then – for added safety – RiverHawk installed jack stands beneath our boat. 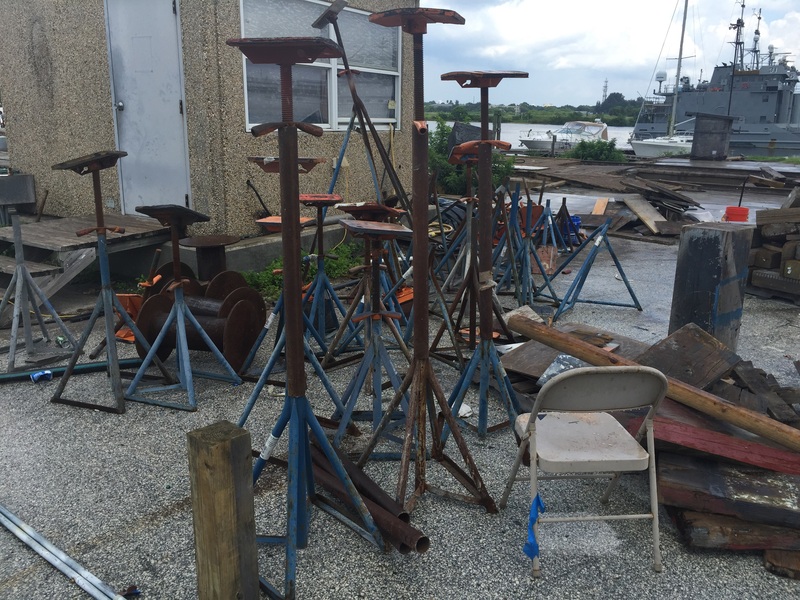 The picture below shows jack stands in the RiverHawk boatyard. After the jacks were put in place, and there was no risk of tipping the workers pushed our boat down a railway track. Bear in mind it’s blisteringly hot here in Tampa, Florida. It was a huge job – pushing 12.5 tonnes of boat. To move our boat off the cable car, today our boat was placed on a huge travel lift, capable of carrying up to 330 tonnes. Here is a picture of the travel lift with SV Aphrodite aloft in the slings. Our mast is 70 feet high, but the Travel Lift makes our boat looks pretty tiny, I think. Our catamaran, SV Aphrodite in the Travel Lift at RiverHawk boatyard. 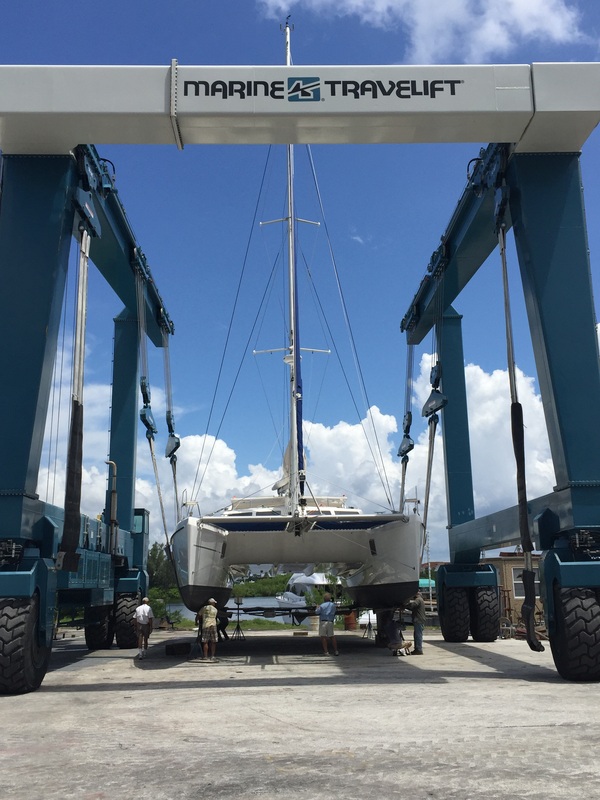 As the name suggests – with the Travel Lift – our boat will be driven to a spot in the boatyard. Frank tells me that his lift is the largest of its type on the West Coast of Florida. We will be in Frank’s boatyard for about a week. The forecast calls for rain. Hopefully, the weather will cooperate. When you think that this is your home I imagine you are very glad for the expertise of all involved. You must be greatly relieved it went so well. Congratulations on your new boat! 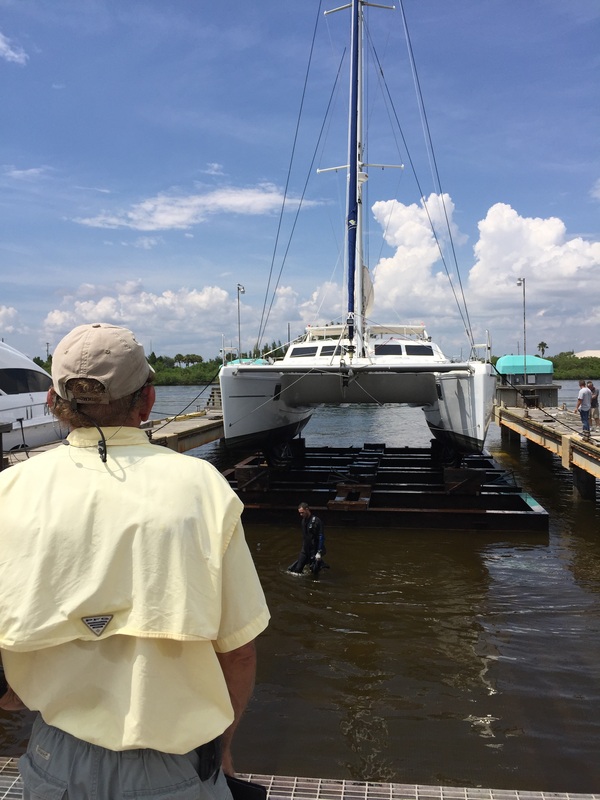 We saw Aphrodite in Palmetto in July – we are in the process of purchasing the Leopard 46 (Sampatico) that was across the dock from you. We are a family of 5 (kids 6, 8, and 11 – one of whom has a life-threatening food allergy) and we are in the process of doing the same thing as your family! 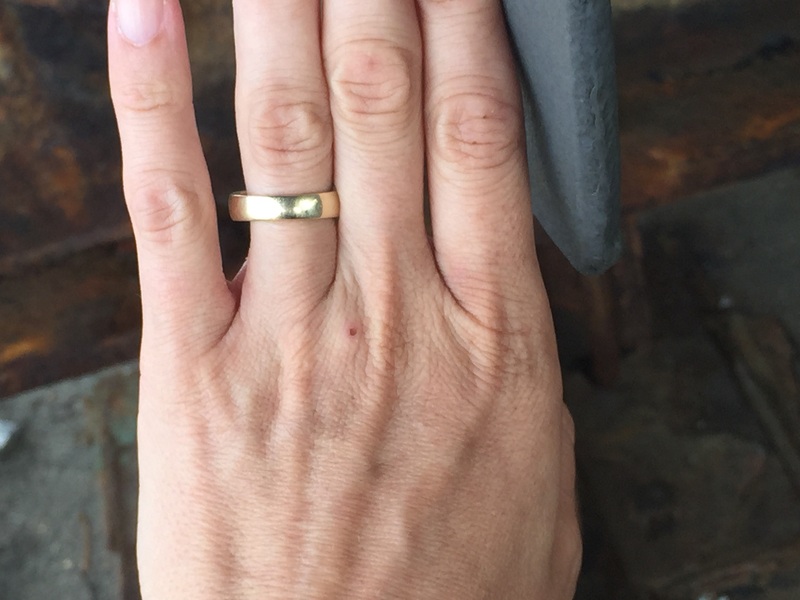 I have only been sailing for a year but my husband grew up sailing smaller boats. Would love to connect and share resources, goals, information.